SKU: ERG-CBM-NH. 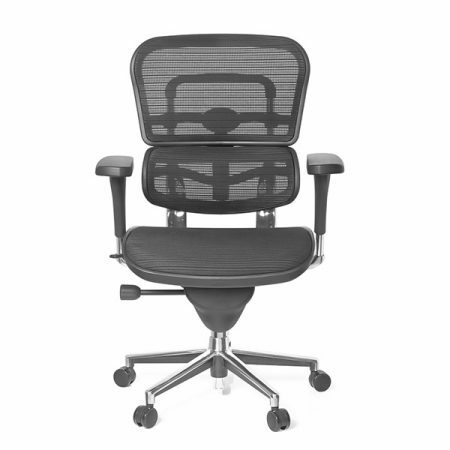 Categories: Ergohuman Classic, Mesh Office Chairs. It's a comfortable, adjustable, good looking, well-built chair with very good lumbar support. I have aeron at the office, and wanted something better looking, and not as common and as "plastic-y" as aeron. This chair is more comfortable, as adjustable, seems to have higher-quality materials, and is less expensive. Lumbar support, out of the box is great, and does not require $80 add-on the way aeron does (which doesn't even work). The only difference in adjustments with aeron is that seat doesn't tilt - only back does, while aeron tilts both back and seat together. Overall ErgoHuman is nicer, comfier, more original and less expensive. Go for it! Comfortable chair. Mesh is quite bouncy wish you had it in other colours.